LOST MY PARTNER blog: when will this be over? part 2: when will my mourning end? when will this be over? part 2: when will my mourning end? 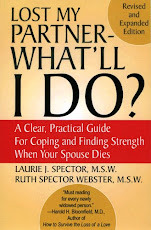 In Part 1 of these excerpts from our book Lost My Partner – What’ll I Do?, we looked what influences the length of your mourning period. · No longer preoccupied with their loss. This doesn’t mean they no longer think about or miss their spouse/partner, only that they’ve found a place inside themselves for that loved one. · Ready to begin making new attachments in their lives. This doesn’t necessarily mean dating or finding a new partner, but rather feeling like they can risk closeness to other people again. · On the way to creating a new sense of who they are. You used to be the other half of a couple, and now you aren’t. When you marry, you blend yourself into who your spouse/partner is, in order to become a couple. The length of your marriage and the age at which you married will affect the extent to which your sense of identity is based on being part of that couple. In Part 3, we look at some important questions to ask yourself . is your pet also grieving? a new year; what's ahead for you?